Services	Rating:	0	out of 5 based on 0	reviews. 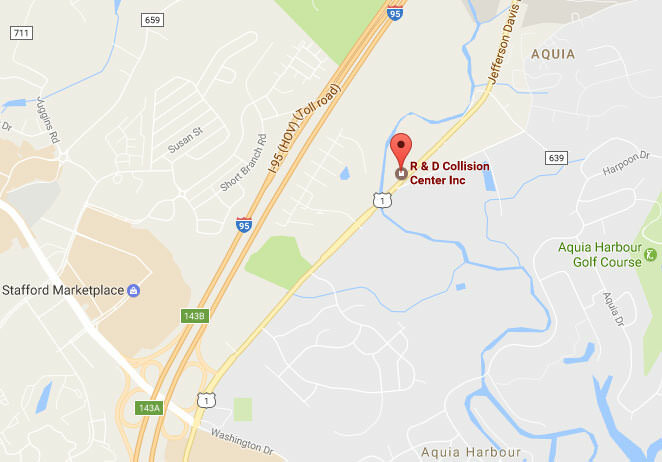 Our Collision Center is located at: 3201 Jefferson Davis Hwy, Stafford, VA 22554 and we provide professional auto body and repairs for collision damage. We work with all insurance companies! Speak with one of our service reps by calling us today: 540-720-3432. One of our specialties is full & partial auto body painting. Whether you are looking to complete redo your vehicle with a beautiful new coat of paint or touch up parts of your car, truck or van because of collision damage — R&D Collision Center provides professional service from start to finish. Read more now about our Automotive Painting Services or to see photo examples of our work. Our technicians have numerous techniques to repair and remove dents you may have received in your car or vehicle from a collision. The severity of the damage will determine what process we use, but generally this involves removing the panel or panels (and any other components as necessary) to access it from the inside. To read more now about our Auto Body Dent Repair & Removal Service or to see photographs of our work.